Biosense Webster announced enrolment commencement of the REVOLUTION study (Clinical workflow study for the evaluation of the multi-electrode pulmonary vein isolation system for the treatment of paroxysmal atrial fibrillation). REVOLUTION is a prospective, multicentre, non-randomised clinical evaluation to assess the safety and effectiveness of subjects undergoing radiofrequency catheter ablation for the treatment of drug refractory symptomatic paroxysmal atrial fibrillation with the nMARQ circular and crescent irrigated catheters, Multi-channel RF generator and Carto 3 system. 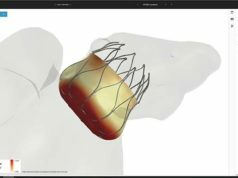 The REVOLUTION study will evaluate the unparalleled design of the nMARQ circular and crescent catheters intended to create contiguous lesions in shapes that are commonly used to isolate the pulmonary veins for the treatment of paroxysmal atrial fibrillation. The investigational nMARQ circular and crescent catheters combine Biosense Webster’s industry-leading open irrigation technology with the advanced 3D mapping capabilities of the Carto 3 system, the most widely used 3-dimensional electroanatomical navigation system on the market today. This study will be conducted in up to 10 centres in Europe. The primary safety endpoint is the incidence of early onset primary adverse events within 7 days of the mapping and ablation procedure. The primary effectiveness endpoint is freedom from documented symptomatic atrial fibrillation based on electrocardiographic data. “With this novel, multi-electrode irrigated ablation platform, Biosense Webster continues its commitment to working towards a cure for atrial fibrillation”. “Coupled with the company’s proven 3D mapping capabilities from its Carto 3 system, I believe this technology will facilitate the ablation procedure for pulmonary vein isolation,” said Pierre Jais, Haut Leveque Hospital, Bordeaux, France and principal investigator of the REVOLUTION study. Atrial fibrillation is the most common heart rhythm disorder, increasing in prevalence with age. Clinical data suggests that up to 20% of all strokes result from the illness, which often remains undiagnosed and which can increase the risk of a stroke fivefold. “The REVOLUTION study will evaluate the safety, efficacy and efficiency of the multi-electrode irrigated catheters combined with the accuracy and guidance of the Carto 3 system for pulmonary vein isolation. We are committed to developing innovative products that deliver optimal results for treating atrial fibrillation,” said Shlomi Nachman, worldwide president, Biosense Webster. The nMARQ circular and crescent catheters and Multi-channel RF generator do not bear the CE mark because they are medical devices for special purposes per the European Council directive 93/42/EEC concerning medical devices, Annex VIII.